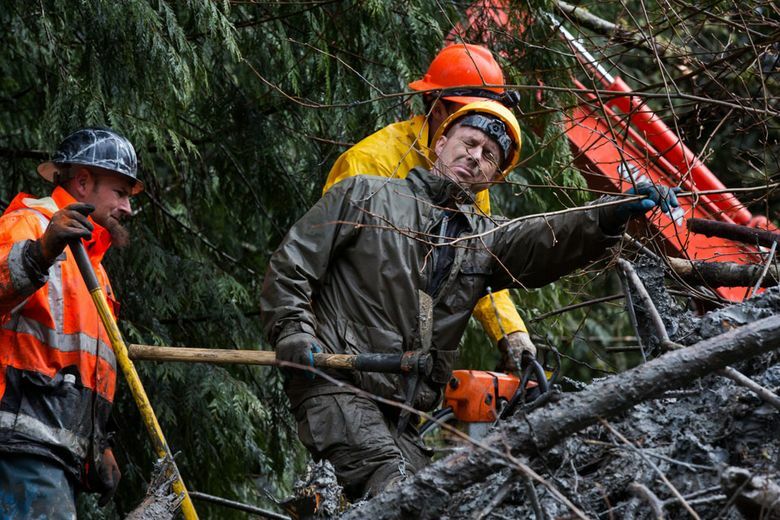 The deadly mudslide in Oso, Snohomish County, in 2014, triggered Pierce County’s efforts to better detect massive mudflows, or lahars, from what is considered the continent’s most dangerous volcano. 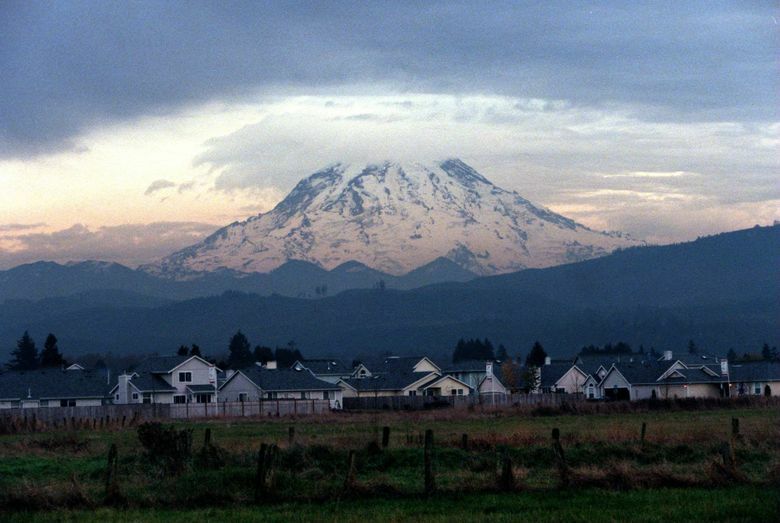 After the deadly Oso landslide enveloped a neighborhood in 2014, scientists and emergency managers launched a review of how they detect massive mudflows on one of the world’s most dangerous volcanos: Mount Rainier. Pierce County Executive Pat McCarthy pushed for the review, which examined the functionality of the current warning system and also compared it to others around the globe, he said. The sensors, which were installed in the 1990s, monitor fast-moving gushes of mud and debris, or lahars. Volcanic mudflows — formed by large landslides or suddenly melting snow and ice during eruptions — are considered the mountain’s greatest hazard. The examination helped Heinze’s department and the U.S. Geological Survey (USGS) make plans to upgrade the detection technology, and now they’re working on a multiyear project to transition from outdated analog equipment to digital. He said the upgrades aim to increase evacuation time for southeastern Puget Sound residents in potential paths of a massive mudflow, which has the consistency of wet concrete. The changes will also produce more accurate and shareable data for seismologists and volcanologists. • Assess your local hazards. • Make a plan for your household by identifying evacuation routes and meeting spots. • Prepare an emergency kit with supplies including extra medications and goggles. • Store a card with important phone numbers and insurance information in a wallet or purse. • Sign up for local alerts and the USGS Volcano Notification Service. • Know how to access NOAA weather radio, as well as identify outdoor sirens if they are in your community. • If officials issue a lahar warning, evacuate quickly by vehicle or on foot and get above the valley floor. Seek shelter in a building or vehicle. One significant mudflow event — around 5,600 years ago — filled the valleys of the White River some 300 feet deep in the area of present-day Sumner, Enumclaw and Auburn. It shifted watersheds, with sediments flowing off for decades to fill what used to be a part of the Puget Sound, near what is now Federal Way. 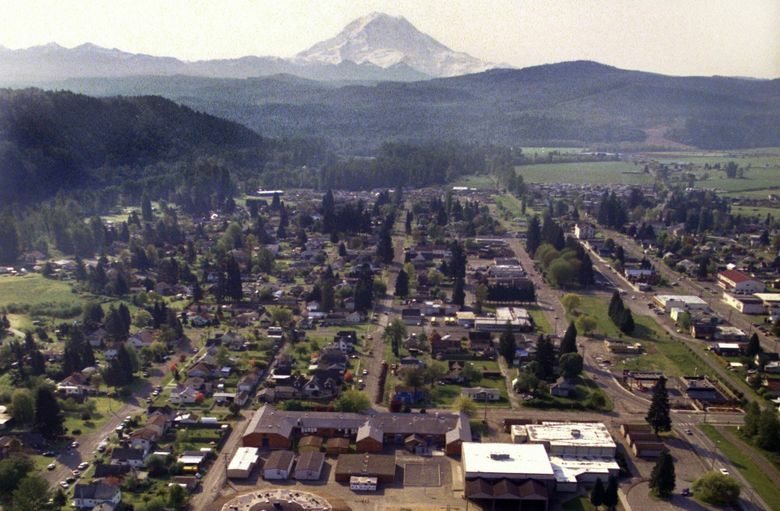 A volcanic flow now could destroy entire cities such as Orting, Sumner, Puyallup and Fife, on the mountain’s western side, as well as close a portion of Interstate 5 and the Port of Tacoma. A computer system at the state emergency-operations center at Camp Murray monitors the lahar-detection sensors, which are in the Carbon and the Puyallup river valleys. If computers detect the rumbling of a lahar, that system alerts 24-hour emergency-monitoring and notification centers, which in turn activate a warning system, according to the USGS. Television and radio stations, such as NOAA Weather Radio, would broadcast alerts. More than two dozen sirens scattered in cities from Orting to the Port of Tacoma would activate. Heinze said officials plan to request money from the Legislature this year to double the number of current sirens, costing $1.9 million. Separately, he said, scientists and emergency managers are in the early stages of planning to increase the number of places with the detection technology to include the White, Nisqually and Cowlitz river valleys, as well as install a volcanic-monitoring network that would offer days, weeks or even months of advance notice of volcanic activity. Mount St. Helens has that technology. The Carbon and the Puyallup river valleys host five lahar-detection sites each, two of which now have the new digital packages. That was Phase One of the long-term upgrade plan. In 2017, project stakeholders hope to have the same setup at all sites, he said. Also in the upcoming year, local officials plan to continue work with congressional leaders to secure funding for completing the digitization project, at a cost totaling roughly $1 million, Heinze said. 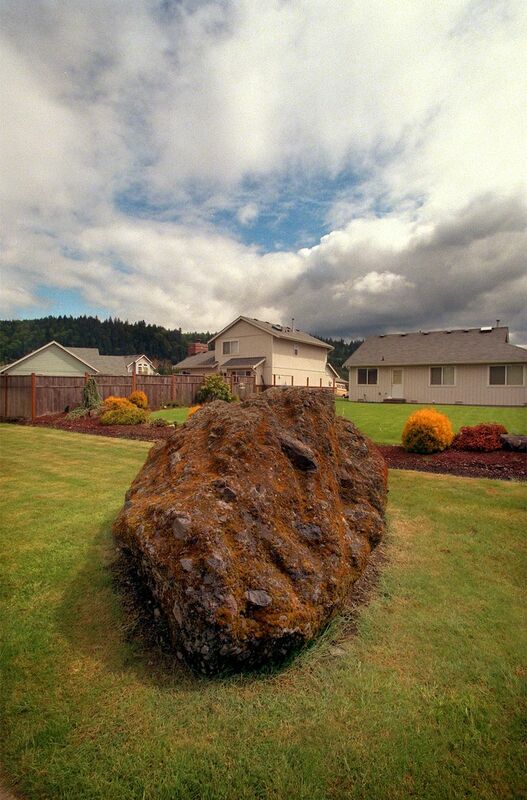 Compared with the Oso landslide — which killed 43 people and destroyed nearly 50 structures when it engulfed the Steelhead Haven neighborhood in Snohomish County on March 22, 2014 — he said scientists consider a lahar in the Puyallup River valley a greater risk. It could travel faster and through a narrower and steeper area, he said. 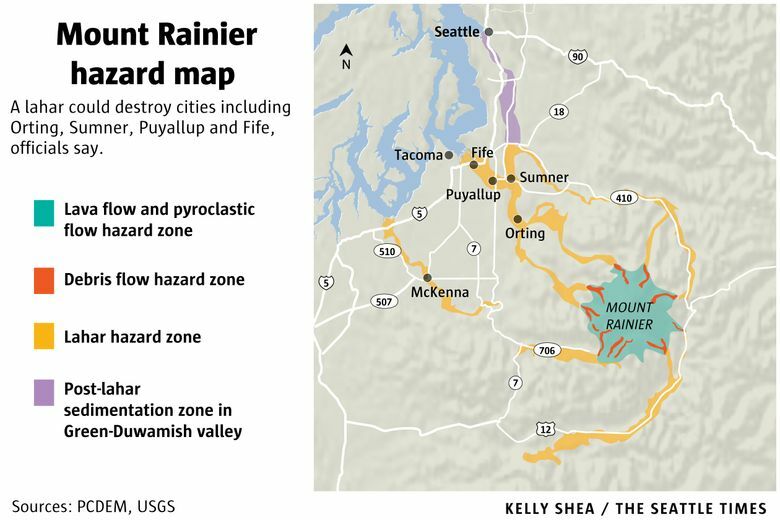 Heinze said the massive debris flow, moving around 60 mph, would likely lose steam in the Orting Valley as it nears Puyallup, though some prediction models indicate that it would reach the Port of Tacoma. The sediment could also wreak havoc on the region’s main transportation routes. According to the USGS, people might have between 40 minutes and three hours to reach high ground to escape the concrete-like mud and debris. Officials have developed evacuation plans with marked routes, and they urge preparedness.